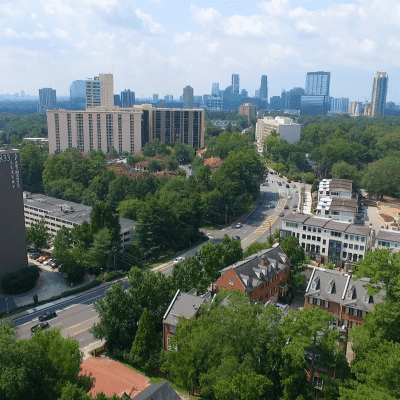 The city of Brookhaven is located in the northeastern suburbs of Atlanta. With a populations of 49,000, Brookhaven is one of the state's most sought-after areas to live. Stretching 12 miles, it's the largest city in Dekalb county and one of the newest cities in Georgia. In 1810, Brookhaven had it's first permanent resident, a European settler named John Evins. Around 1900, cottages were constructed in the area and by the 1950s, commercial development had begun. The idea of incorporating the city was introduced in 2007. Brookhaven was officially incorporated in 2012. Town Brookhaven is a pedestrian-friendly, mixed-use development consisting of 400,00 sq. ft. of shops and restaurants. The complex boasts a Cinébistro theatre, Costco, L.A. Fitness and much more.